Without any prospect for a better life, Candice agrees to the arrangement in exchange for a carte blanche and a considerable settlement. Soon, Rochedale learns that his bride is much more than she seemed–and his ill-considered arrangement means that she has free reign to live her life as she will, no matter how unconventionally. Candice is not the meek creature he assumed. He didn’t ask her questions about her past, which turns out to be unusual–to say the least. The daughter of a doctor and nurse, she grew up in a harem in India until, as a teenager, she began to work side-by-side with her parents in clinics for the poor. Fluent in Hindi, more at home in a sari than Regency gowns, Candice is determined to use her new-found financial freedom to go deliver babies for East Indian immigrants and nurse in hospitals in the slums. In high society, Candice blurts out the most radical ideas. 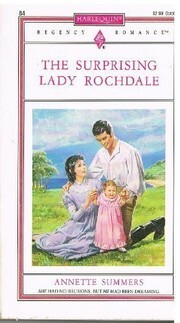 She is pitied by Rochedale’s friends and family, who condemn his rash act–which will set a eighteen-year-old girl loose in a year with a plump pocket and a ruined reputation. Soon, Candice is surrounded by adoring men, which drives Rochedale to distraction (even if he continues to carouse and flaunt his mistresses). By the time Rochedale learns that he loves his wife, she is quarantined in a hospital treating victims of the plague. When she emerges after surviving the illness herself, she brings home a prostitue’s baby that she’s determined to adopt. Once again, Rochedale is in a rage. Meanwhile, he has his own dark secrets: he is rumored to have killed his first two fiancées. His hunt to discover the true murderer obsesses him (and has driven him to dissolution). Of course, he doesn’t think to warn his wife that she might be the target for a murderer. That would make too much sense. Instead, he reveals his entire backstory to Candice in a long, expository monologue that comes too late in the book. Unlike in the traditional “Reformed Rake” story, author Annette Summers does not show Rochedale becoming less wild as the novel progresses. The only sign that he might clean up his act is the assertion that his crotchety Uncle Edward became a good man after marrying. Not very convincing, and not a change that seems likely when the hero is already so far gone down the path to alcoholism and sexually transmitted diseases. I could easily see Candice and Rochedale’s marriage turning into Tenant of Wildfell Hall. Candice is better conceived than the hero. I like the idea of an Englishwoman experiencing reverse-culture-shock. Having grown up abroad, Candice finds London society trivial, trying, and unnatural. She wants more than anything to go home to India. However, I think it is unlikely that such a shocking woman would attract so many admirers, all of whom would love to marry her at the end of her term with Rochedale. Four competing suitors strains credibility. In the end, The Surprising Lady Rochedale is a bad romance because of its despicable hero, its improbable heroine, and their stagnant relationship. Although it gave me fodder for a long review, it was not enjoyable, and I do not recommend it–unless you want to watch Rochedale squirm for 220 pages as he realizes the stupidity of his own actions.